Today we have lost the amazing composing talent of John Barry who has died of a heart attack at the age of 77. I, along with countless others, have been inspired, encouraged, and entertained by his wonderful music. Over his amazing composing career John Barry wrote a wonderful variety of memorable themes and film scores including Midnight Cowboy, Born Free, Chaplin, The Black Hole, Indecent Proposal, The Ipcress File…(the list goes on! ), and 11 James Bond films. One of my all time favourite John Barry themes is from the 1979 film The Black Hole. May you rest in peace John Barry O.B.E. Came across string arranger and orchestrator Pete Whitfield‘s Disco Strings video today – think it’s a great introduction to using strings in disco music and for a good intro to strings in general. Very well put together and informative. Who Has Music On DAT? There are some people probably wondering what a DAT is. The joy of being young! When I was starting out not too many years ago way way back in the 1990s the Digital Audio Tape was, before the invasion of affordable hard drives and CD-Rs, a widely used stereo format in recording studios. I liked using DAT; always found it worked extremely well and my trusty TASCAM DA-20 MKII, and SONY Portable TCD-D7, recorded many hours of music for me. I was doing some digital transfers yesterday from a client’s batch of old DAT tapes (it’s sad how ‘old’, in this case, is only 8 years!) and it drew my attention to the large amount of my tracks that are on DAT. There are some absolute masterpieces on those tapes from my early years (I know this to be fact because my dear Auntie told me) and I would like to keep them to enjoy a warm nostalgic moment later in life. I’m now going to start the lengthy process of transferring them to hard drive, hopefully before that format is superseded! How many of you still have your precious work on DATs? Do you still use them? How Is Spotify Doing It? Have you read Ian Shepherd‘s blog posting entitled How Spotify might defuse the Loudness Wars. A post where he beautifully presented his case but got his facts wrong. What did he do about it? Anyone who follows Ian will know the quality of his content and respect him so it wasn’t a surprise when he apologised to Spotify, edited the post whilst leaving the original text for clarity, and notified everyone of the change. Ian has also followed up this article with Why I was wrong about Spotify. Both our definitely worth a visit. Like Ian, I love Spotify. The rapidly expanding music catalogue delivers a huge diversity of choice; I thoroughly enjoyed discovering Quincy Jones‘ Early Jazz Years album last week. Recently it has been extremely useful for quickly looking up tracks when clients request sound-a-likes and tracks in-the-style-of. I have noticed in use that Spotify takes a happy medium for it’s loudness normalization by increasing the volume of quieter tracks and reducing the louder ones. To reiterate Ian’s thoughts on this feature, done properly in players, it might indeed defuse the Loudness Wars. I would like to see a slider option, with say five increments of how the normalisation would operate to give choice to the end listener but, for now, Spotify has taken a step in the right direction. You can join Ian on Twitter (@ianshepherd) and check out his fantastic Production Advice website. When was the last time you did a backup of the data on your computer? Even if you have, here’s something that might interest you. I have a family of external LaCie drives in the studio that has expanded to the point that, when I was considering more backup and archiving space in March, I thought there must be another option. I’d be buying two new drives, one to back up the other, taking my total of external drives to eight and increasing the amazing spaghetti junction of power units and firewire cables in the process. Into the breach steps the Drobo from Drobo. [The company that produces the Drobo was formerly none as Data Robotics]. One box, one power unit, one cable, and up to 16TB of hard drive capacity! The unit connects via Firewire 800 and USB 2.0, and has four SATA hard drive bays which are extremely easy to populate – push the drive in and click. That’s it. The unit takes care of everything else. Simply put, the Drobo backs itself up. It is based on a RAID system but with some smart improvements like it’s possible to use a combination of different size hard drives plus a drive can be removed/inserted while it’s running. A quick look at the Drobo videos should give you a good understanding of this piece of kit and, if you want more, their website is very informative. The initial outlay of the Drobo is a little pricey (currently available at Amazon for just under £400 plus drives) but, for the simplicity and low cost of expansion, space saving, and peace of mind, I feel it’s worth it. I’m not getting rid of my LaCie’s though; the more disc space the merrier! Plus it’s always handy to have a bootable system disc copy for the Mac just in case. Drobo have recently added the DroboPro to their line up; has slots for eight hard drives! The much discussed Loudness War rages on with artists, producers, record companies, et al, fearing that their musical creations will not succeed unless they are louder, or as loud, as the competition. Several attempts, and tools, have been made to educate us about the current situation – Bob Katz and his K System, the Turn Me Up organization, etc. – and how, without good dynamic range in music, we miss out on so much punch and emotional impact when music is over compressed and limited. Imagine an action film with an explosion the same loudness as the background level – as impressive as being slapped around the face with a feather. Thankfully the film industry understands dynamic range and utilises it to make films a pleasure to watch and hear. In January 2009 a new initiative was launched by the Pleasurize Music Foundation. Their aim is to standardise a reference for music production with a simple label system, stating the dynamic range of a recording/album, that can then be displayed with the relevant music to inform the listener. They have created an easy to use plugin for Macs & Windows machines that calculates the D.R. (Dynamic Range) value in realtime. The offline meter, which will give a reading for a whole track, is currently only available for Windows machines; a Mac version is due in June 2009. Our aim is to improve the sound quality of music in its various recorded formats – including data compression methods such as MP3 – as well as music destined for radio broadcast. Only music that provides a positive musical listening experience has real market value. The Foundation’s aim is to increase the value of music within the creative production process for the entire music industry. Guns N’ Roses‘ latest album comes to us via mastering engineer supremo Bob Ludwig with a request from Axl & Co. that they didn’t want it smashed. Really? 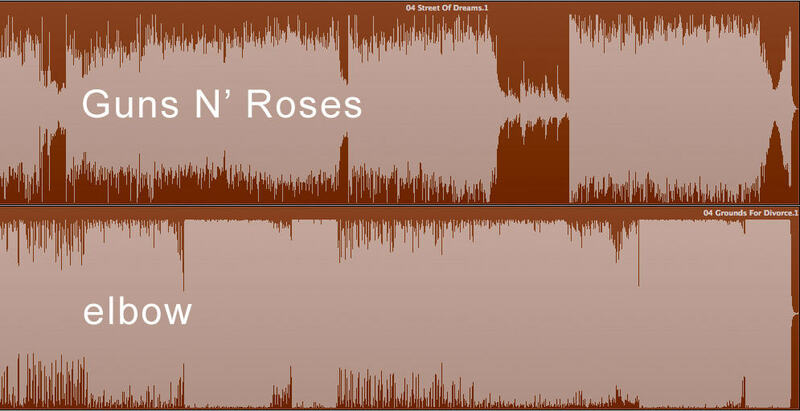 After Turn Me Up‘s certification debacle of Elbow‘s “The Seldom Seen Kid” – fantastic album but doesn’t really hold up to being much more dynamic than other current albums [image below] – I was rather sceptical of Ludwig’s assertion that the tracks on Chinese Democracy had “no compression that was used just for loudness, only compression that was needed for great sounding rock and roll”. Finally bought myself a copy and played the CD in the studio. This is a beautiful sounding album, with well crafted multi-layered and dense mixes, that really pop out of the speaker. So much more enjoyable to listen to than at the Loudness War volume to which we have become accustomed. This style of music is inherently going to be fairly loud to begin with but it’s encouraging to see that it wasn’t taken further just because it is possible. Currently enjoying it in the car with my favourite track of the moment being “If The World” (tr.5). As an aside, here’s a great little video from Greg Calbi (Senior Mastering Engineer at Sterling Sound) about compression and the Loudness War in mastering.